One of the most scenic lighthouses in the country, the light station on South Manitou Island was established in 1839 to mark the location of the only natural harbor between northern Michigan and Chicago. Ships took refuge here during storms, and steamers stopped to take on wood for their boilers. Its100-foot (30 m) tower dates from 1871. 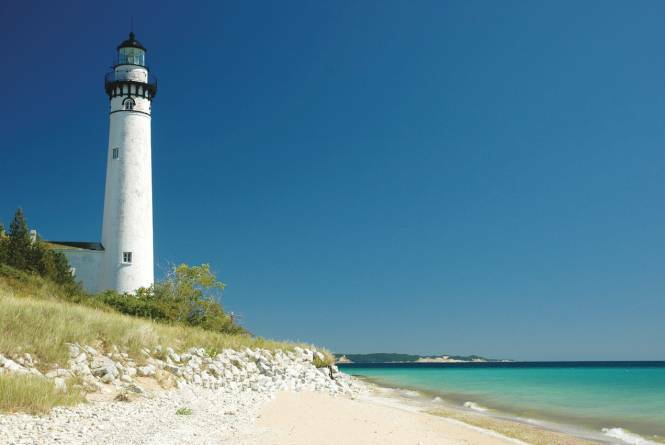 Decommissioned in 1958, the lighthouse is now part of the Sleeping Bear Dunes national Lakeshore and is open for regular guided tours during the summer. The island is accessible by ferry service from Leland; for details call the National Park Service at (231) 326-5134.